Interlochen Center for the Arts is honored to announce that Camp alumna Marilyn “Mimi” Garbisch Carlson has created the Frances Blaisdell Endowed Scholarship in Flute. Frances Blaisdell was a pioneering flutist who was the first woman wind player admitted to the Juilliard School of Music and the first woman to perform as a soloist with the New York Philharmonic. She was a beloved teacher and mentor at Interlochen Arts Camp alongside her husband, clarinetist Alexander Williams. Mimi’s generous gift was given in the form of a Charitable Gift Annuity (“CGA”). To create the CGA, Mimi transferred appreciated securities to Interlochen, which, in turn, agreed to invest the funds and pay Mimi a set amount of income for her lifetime. Upon Mimi’s passing, the amount in the annuity account will be used to fully fund the Frances Blaisdell Scholarship Endowment. Frances Blaisdell began her advanced flute studies with George Barrère at what is now the Juilliard School of Music. Later, she studied with Marcel Moyse and William Kincaid. In the 1930s, she was principal flute of the National Orchestral Association, the New Opera Company, and the New Friends of Music. While her first appearance with the New York Philharmonic was in 1932 (when she soloed in a children's concert), she was refused an audition in 1937 because of her gender. However, she again played with the orchestra in 1962 in a piece that required extra flutes. In 1973, she moved to California to teach at Stanford University for 35 years. Mimi Carlson spent three summers (1960-62) at the National Music Camp where she was honored to study with Frances Blaisdell. In 1962, Mimi was in the orchestra that played on the White House lawn for President Kennedy. She credits her time at Interlochen, especially the opportunity to meet outstanding musicians her age from around the country, as her inspiration to “get really serious” about playing the flute. Frances Blaisdell’s mentorship was also critical in Mimi’s professional development. She is now a member of Symphony Silicon Valley and Principal Flute for Ballet San Jose. She was a member of the former San Jose Symphony from 1973 through its final season in 2001, playing both flute and piccolo. She has taught at Santa Clara University since 1978 and also maintains a private teaching studio. 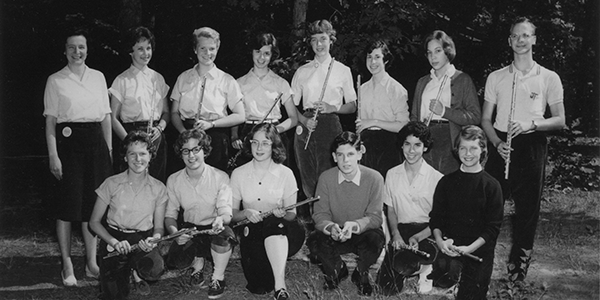 The Frances Blaisdell Endowed Scholarship in Flute will benefit flute students attending Interlochen Arts Camp.